The year 1908 introduces a period of special brilliance in Rupert Bunny’s art embracing such masterpieces as A Summer Morning, c.1908, in the collection of the Art Gallery of New South Wales, and the more personally sized Last Fine Days, Royan, c.1908, in the Newcastle Art Gallery. Paintings of enticing beauty such as At the Beach, c.1908 (private collection); Le Bel Après Midi, Royan, c.1908 (private collection); Shrimp Fishers at Saint-Georges, c.1908 (National Gallery of Victoria, Felton Bequest); and La Chenille Verte, c.1908 (once in the collection of Sir Reginald Marcus Clark), followed close upon each other. Bunny was at the height of his creativity, his beautiful wife Jeanne his muse and his model. The evolution of some of these paintings is recorded in Bunny’s Villa Lili, St Georges sketchbook – figure studies of Jeanne patting a dog, feeding pet rabbits, or plucking a flower, together with compositional sketches for La Chenille Verte (The Green Caterpillar), The Cliff Path, and Oyster Gathering (St Georges).1 Jeanne and her lady companion feature throughout in sunny outdoor and interior scenes, or on a shaded balcony. The vivacity of handling increased in each successive painting to achieve the light-filled freedom characterised by The Swing, c.1913 (private collection). Bunny is a painter of sunlight, sensuously caressing the flesh and fabric, and filling the canvas with a sparkling atmosphere of warmth and pleasure, an interest reflected in his oft used title, ‘Sun Bath’. At the Pump celebrates this delight as a transient moment of the everyday captured in paint. 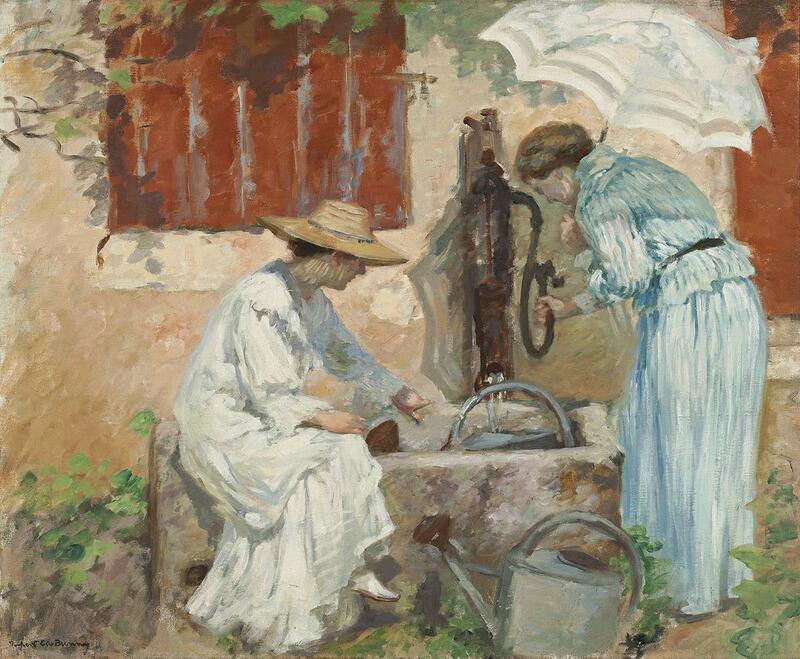 As Jeanne watches her companion pump water to fill watering cans for the garden, the prosaic is transformed into the poetic by dancing touches of the brush, full of light and colour. 1. Villa Lili, St Georges Sketchbook II, c.1908, formerly in the collection of Dr Ewan Murray-Will, Sydney, since broken up. 4. A champion of Claude Monet, Geffroy was one of the first to write on Impressionism. Paul Cézanne painted his portrait in 1895.